If you’re late to the game and still haven’t seen Luther then I’m here to tell you that you absolutely must! And I don’t say that lightly! 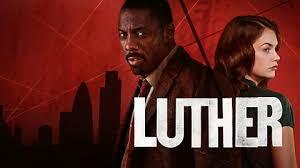 Luther is the story of DCI John Luther portrayed by the fantastic Idris Elba. The detective we instantly loved for his absolute dedication to solving a case and getting murderers behind bars, even if his methods often lie outside the realms of what might be considered acceptable. The first ever episode shows Luther’s career possibly hanging in the balance while waiting for a suspect in a coma to wake and confirm whether Luther pushed him to his fate or not. We gradually learn how Luther’s relenting dedication to catching criminals has impacted his home life and personal relationships. Whilst Luther may be willing to bend the rules to support his colleagues there are fractures in the station- only some believe in Luther and support his methods and when again and again Luther comes under fire those he thought he could trust turn on him, with the most dire consequences. When Luther has no-one left to turn to, no-one who believes in him there’s only one person left he can turn to. The criminal that he didn’t manage to get behind bars. Enter: Alice. Luther’s methods always come back to bite him, and whilst he usually survives it in the end, the story is never that lucky for the people he loves. By series five it gets darker as we see Luther, yet again, getting himself in too deep and the ones he loves paying the price. But this time, there’s no way out. I don’t know if there will be a series six. In so many ways they tied it up brilliantly. But I really really hope there is!